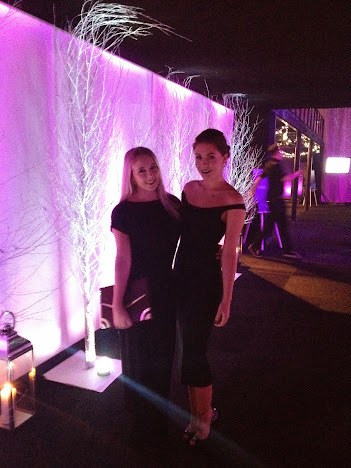 As you may already know myself and Joanne attended the New Look Winter Wishes Ball last week which took place at the Battersea Evolution located in the heart of Battersea Park. The dress code was a black tie and we were greeted by an array of floor length sequin gowns, thigh high slits and plunging necklines. I was in awe by everyones attire! I didn't manage to take any proper snaps of my outfits (just the venue and the food, typically!) so excuse my terrible quality iPhone images! I had a frantic panic the night before and placed a last minute ASOS order. This black bardot body con dress came to the rescue which I paired with my Christian Louboutin lady peep heels and a dark red lip. The evening started off with a champagne reception followed by a three course meal which was broken up between a live auction (with raised tens of thousands!) and a performance from the dance group flawless. With our last trains leaving at 1030pm we wolfed down our 3 piece dessert and had a quick pose in the Photo Booth waving goodbye to the Saturdays performance. Swapping heels for flats we not so elegantly ran to the station. REMINDER TO SELF-book a hotel for these kind of events!! P.S If you didn't know already I've teamed up with Beara Beara to host my first ever giveaway! You could be in the chance of winning this backpack so make sure you enter here. Best of luck! Elegant post what a great event you look beautiful. You looked amazing! Love your make up. You look gorgeous! Love the lip colour - is the heart on your collar bone a tattoo? Love it! Sounds like fun even though you had to leave early. Great dress! So jealous! I would have loved to have gone, you look incredible as well!